Shopping bags and parcel tape: Rosemary Waugh reviews Rufus Norris’s after-the-war Shakespeare. Macbeth at the National Theatre. Photo: Brinkhoff Mögenburg. Post-apocalyptic settings are tricky. Not least because of their implicit fallacy: in the event of the apocalypse, there’s very little chance of their being anything post- it at all. Rufus Norris’s Macbeth at the National Theatre isn’t, strictly-speaking, post-apocalyptic, it’s set ‘now, after a civil war’. But its overall aesthetic owes a lot to the post-apoc genre. I’m going to wave around a reference that only a small amount of people with wasted, fairly-recent youths will get, but it’s similar to The Tribe, a television series about children left to fend for themselves after a virus kills all the adults. Broadcast on Channel 5 between 1999 and 2003, it was mainly remarkable for the characters’ elaborate fashion and make-up, a 90s mash-up of early era No Doubt, astronauts and classic goth. At the time, I thought it was pretty cool and watched it mainly for the hairstyles. But as I grew older and more cynical, doubts began to whisper to me. Namely, if this was the end of the world, then where did they get all the hair dye from? Similar problems arise with this attempt at a punked-up Macbeth. The setting becomes a major distraction at the cost of pretty much everything else. If a civil war really did occur ‘now’ – and assumedly ‘here’, as in, the British Isles – would this really mean we suddenly all started dressing from the lost property tent of Glastonbury Festival? Or partying with cardboard boxes on our heads? Or endlessly waving plastic bag, after plastic bag, after plastic bag? Would the landscape really be dotted with Dr Seuss’s truffula trees made from bin bags? And where would all those endless rolls of parcel tape come from? The aim, I presume, was to create an especially atmospheric Macbeth, one seeped in inky-black mystique. But unfortunately the result is bizarrely flat. This might be because in contrast to the denseness of the production stylistically, the dialogue is frequently delivered with complete impassivity. Rory Kinnear plays Macbeth as the-bloke-down-the-pub, making some of the most famous monologues in the history of well, theatre, sound as dramatically intense as a food order. But other choices don’t help, such as a notable lack of any sound design (Paul Arditti) for large parts near the beginning, meaning the unimpassioned speech of the often-static characters becomes part of a greater void, that at its most uncomfortable starts to feel like an embarrassed silence. Awkwardness is actually a bit of a feature of this production. The stage design (Rae Smith) has the vast Olivier stage partitioned off by two large back-curtains that hang down like dripping sheets of seaweed, with the remaining space dominated by an elevated walkway, which thrusts out like a giant tongue towards the audience. With the performers mostly positioned towards the front of the stage, it seems like a very deliberate attempt has been made at overcoming the perceived ‘problems’ of the auditorium, as though the production team were scared of everything getting lost onstage, so decided instead to shove it forward, forward, forward as much as possible. You can appreciate why that seemed like a good idea, which is something that could be said for other aspects of the production, including the overall impetus to stage a (relatively) radical Shakespeare. There are brief, tiny glimpses of the idea coalescing, such as just post-interval when the setting slips into full-on surrealist territory with marching rows of back-to-front masked something-or-others. 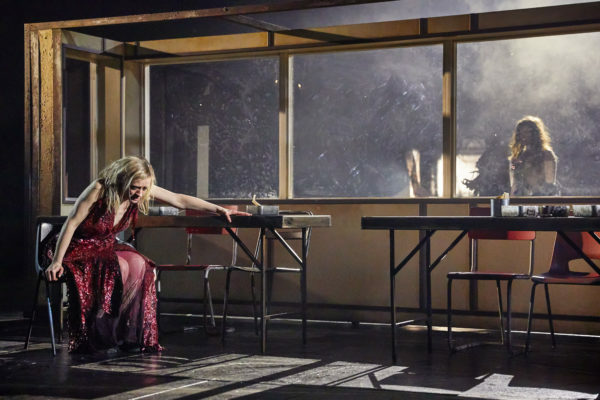 Or with some of Lady Macbeth’s scenes, where Anne-Marie Duff adds little undercurrents to the lines, like making “under my battlements” sound brilliantly dirty. The beauty, in theory, of an after-the-end setting is that it grants people the liberty to create something entirely new. But Norris’s Macbeth works out as the opposite. You can feel it bowing under the pressure of this huge, heavy aesthetic, this urge to make it anything but a traditional Shakespeare (and so strangling the brilliance of the original play in the process), and perhaps this fear that it will evaporate into the space, so needs to be slammed towards the audience as much as possible. Ironically, what it probably needs is for everything to be wiped out and to start again without all the baggage (and the bags). Macbeth is on until 12 May 2018 at the National Theatre. Click here for more details.